It’s got to have a V8, right? That’s pretty much the consensus when it comes to muscle cars like the Ford Mustang. And while that adage still holds true for the monied purists, those opting for muscle cars with a smaller cylinder count aren’t exactly left out in the cold now. Case in point is the 2017 Mustang EcoBoost which is an entry-level model in name only. Far and large, it’s a real deal muscle car and not just some poser mobile. Okay, admittedly, the expected baritone V8 rumble is MIA, but hey, as long as it’s got grunt, it’s fine, right? Displacing 2.3 liters, the 4-cylinder (yes, half the displacement and half the cylinder count compared to the 5.0), this Mustang delivers some satisfyingly linear performance. It’s bookmarked by some lag at lower revs and boost that drops off close to the redline, but for the most part, it’s got strong, accessible power. Bury the throttle and as the tach spins from 2,500 to 6,000 rpm, it pulls with neck-snapping acceleration. Ford says the century mark is hit in about 5 seconds, but honestly, it feels faster than that. Equally deserving of high praise is the accompanying 6-speed automatic. It’s smooth and reasonably fast to up- and downshift, doing so without any histrionics. Civilized driving is rewarded by a comfy experience; tackling a long-distance cruise is certainly no sweat here. Engage the Sport mode though and all those 310 horses suddenly let out in a wild stampede. Dig in, hang on, and the Mustang blips on downshifts and delivers a restrained burp on wide-open-throttle upshifts. It’s like riding a wild buck. And it’s awesome. Now if it only sounded like it. That four-banger may be loud and bellicose, but it also sounds artificial and hollow. It also has a tendency to drone at speed. In short, the Paul Walkers of the world may like its tunability, but the Vin Diesels will probably throw a wrench straight into the drive belts. This engine is divisive to say the least. Oh, it’s worth noting that the promised fuel economy just isn’t there. After almost a week of driving, it registers a disappointing 5.31 km/L. Thankfully, there’s one thing that everyone can agree on and that’s the Mustang EcoBoost’s enhanced handling. With around 90 kilograms shaved off the V8, it’s pointier than the V8. The lack of fat upfront has made the already solid Mustang driving manners even sharper. The steering is immediate and linear from lock-to-lock. It’ll leave any driver, regardless of engine preference with a wide grin on their face. There’s also minimal body motions, especially when pushed. It’s so good that you need to remind yourself that you’re driving a Mustang every now and then. Normally, there would be a large trade-off between handling and ride. Thankfully, this isn’t so with the Mustang. Although it’s not as pointable as something like a Toyota 86 / Subaru BRZ or Mazda MX-5, it carves corners reasonably well while still absorbing pockmarked roads with extreme ease. With the exception of unfiltered crashes on the largest of bumps, it rides pretty much like a comfy sedan. That mental image of being in a cushy sedan completely disappears the moment you step into the Mustang’s cabin though. The low-mounted seats, high-set hood, dash, and doors will make the typical Filipino driver feel almost inadequate to tame its power. It takes some adjustment, but this is one car you’ll be afraid to drive a narrow city street in. Thankfully, it’s got sensors aplenty including a rear parking camera. The dashboard, for the most part, feels upscale. The brushed metallic trim, commemorative plaque on the passenger side, and toggle switches for buttons all do their part to create a playful experience. The small-diameter, thick-rimmed steering wheel, and Recaro seats also do their job of making the Mustang feel like a serious speed machine. Even the infotainment system, now equipped with SYNC 3 is easy to use and understand. It even comes with Android Auto and Apple iOS built in too. However, for all of the Mustang’s toys, start poking around a lot more and the build quality noticeable degrades. This is especially true for areas not commonly touched. The top of the dashboard, door panels, and even map lights are some of the parts that feel plasticky. Though the graining somewhat masks it, the Mustang cannot deny it’s blue collar origins. Though the dashboard itself could use a bit of an upgrade, outside it’s still an eye-catching car. Despite being sold in substantial numbers locally, it can still draw attention with its retro-futuristic vibe. The looks have been covered ad nauseam, so heading straight to the bottom line: anyone will be hard-pressed to tell the difference between the EcoBoost and the V8. And for a lot of buyers, that’s a huge plus. While aficionados will argue that the Mustang is nothing without a big honking engine upfront, for the first time ever, one can also argue that the best Mustang is the one without the V8. No longer is the entry-level Mustang just playing second fiddle to the 5.0 V8. For sure, some people are going to give you flak for buying the turbo rather than the V8, but just ignore them. At the end of the day, it’s a proper turbocharged rear-wheel drive coupe. The Mustang badge on the nose is just a bonus. Production has just started in the US a few months back. Expect it to arrive around first or second quarter 2018. Likely around mid next year. For my purpose a v8 is too much. Some people really can't cope up with modern times. It's those same people that think putting turbo in a ferrari is blasphemous. Stubborn fools. Not a Mustang eh? Everyone seems to keep forgetting that there was a r cylinder Mustang back in the day. All these its not a mustang if it aint a V8 bullcrap shows how clueless some people really are. 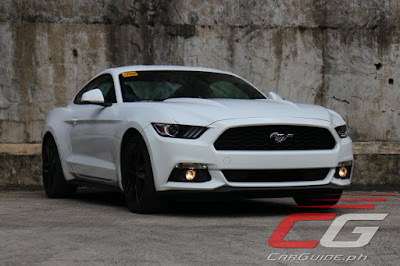 Medyo deathtrap naman ang Mustang. 2 out of 5 stars sa ANCAP at Euro NCAP.